Banish those post-Christmas/ pre-New Year blues with some uplifting music at Birmingham's Symphony Hall. Expect some patriotic fervour on December 27 when Hilary Davan Wetton conducts the London Concert Orchestra at the Last Night of the Christmas Proms. Soprano Madeleine Pierard and tenor Nicky Spence will be joined by Jonathan Antoine from Britain's Got Talent for an evening of stirring music, including Sibelius' Finlandia, Verdi's La Donna è Mobile and excerpts from Tcaikovsky's Nutcracker Suite. And, of course, there will be all the Proms favourites – Rule Britannia!, Hornpipe and Land of Hope and Glory. The London Concert Orchestra returns on December 28 for a different type of classic music – Abba Classics. West End singers Annie Skates, Emma Kershaw, Dean Collison and David Combes join the orchestra and Capital Voices for a host of Abba hits, including Dancing Queen, Waterloo and Mamma Mia. A party is guaranteed. 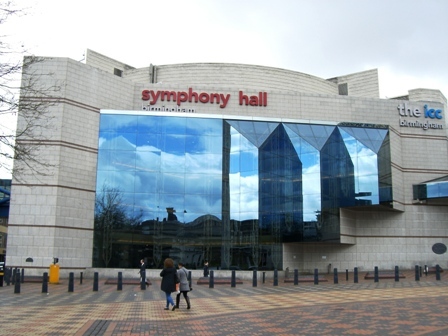 If the music of Handel is more to your liking, Symphony Hall at 2.30pm on December 29 is the place to be. Glorious Handel by Candlelight will feature the likes of Zadok the Priest, Sarabande and The King Shall Rejoice performed by the Mozart Festival Orchestra in full 18th costume, the Canzonetta Choir and soprano Daisy Brown. Broadway and West End musicals are the focus at 7.30pm on December 29. The Sound of Musicals boasts the Manchester Concert Orchestra, conducted by Richard Balcombe, and the all-star line-up of Kerry Ellis, Joanna Ampil, Oliver Tompsett and Graham Bickley performing the best tunes from the likes of Oklahoma!, Billy Elliot, Wicked, A Chorus Line and The Phantom of the Opera. There's a clash of the film music titans on December 30 – but the winner will be the audience who will enjoy some of the greatest film music ever. The London Concert Orchestra will run through the film scores of Hans Zimmer and John Williams so movie buffs will be treated to theme tunes from the likes of Star Wars and Superman, Gladiator and Batman Begins, Harry Potter and The Da Vinci Code. Which is better? Who cares – this will be a musical feast! And so to New Year's Eve. Welcome 2017 with the London Concert Orchestra, conducted by Anthony Inglis, and some great classical music. Guest vocalists Adrian Dwyer and James Cleverton will join the orchestra for a repertoire that includes Debussy's Clair De Lune, Tchaikovsky's Sleeping Beauty Waltz and Walton's Crown Imperial. A classic way to say goodbye to 2016 and hello to 2017.